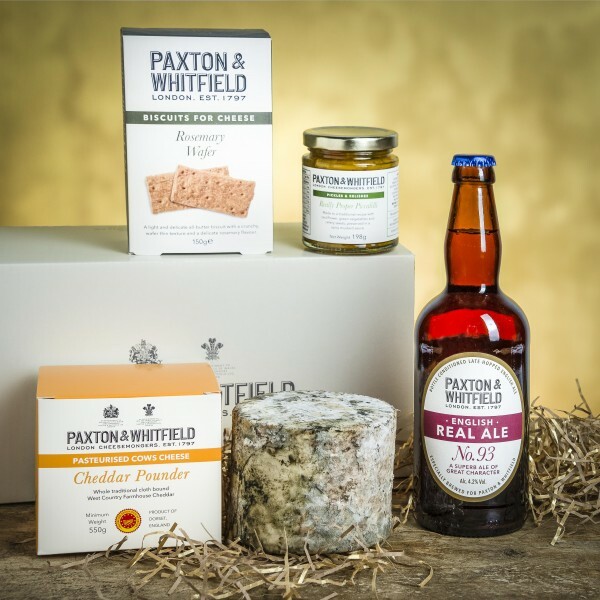 Simple but stunning - a great combination of Paxtons Cheddar Pounder PDO 550g and No.93 Real Ale 500ml with some fine food treats, all presented in a gift box. A perfect gift and not just for 'the boys'. A cloth bound Cheddar Pounder PDO 550g (pasteurised, vegetarian), a bottle of our No 93 English Real Ale 500ml, Rosemary Wafers 150g and a jar of our Really Proper Piccalilli 198g. All presented in one of our Medium gift boxes.